Molded products | Showa Rubber Co., Ltd.
We can carry out the entire process from mold design to material testing and even mass production all in-house according to customer needs. We can carry out product manufacturing for a wide variety of sizes from small items of 1mm or under up to items over 3m. 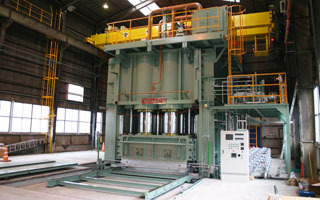 Our company has a 5000t large scale press, the largest in the country. 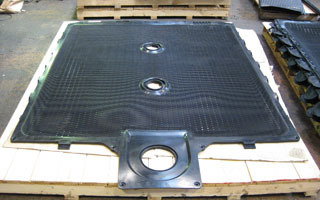 Using this large scale press we can make large, wide rubber molded products which were formerly only possible by connecting multiple smaller products, creating high quality products of a single piece with no seams. ･ Food industrial gaskets, etc. Natural rubber (NR), chloroprene rubber (CR), nitrile rubber (NBR), butyl rubber (IIR), styrene-butadiene rubber (SBR), silicon rubber (Q), ethylene-propylene rubber (EPDM), etc. These are only samples of the rubbers we use. We use these raw material rubbers and our company's blending techniques to create rubbers which satisfy customer requirements. We can carry out manufacturing with a variety of rubbers from hard rubber to soft rubber, black rubber to transparent rubber, colorful rubber, rubber with super abrasive resistance, rubber with high mechanical strength, etc. We also have the technology to design molds suited to product forms allowing us to handle orders for a wide variety of applications.